SKU: SKU 122. Categories: Bags, Carolina Monogram, Clutches and Purses, Designer Inspired Purses, Designer Inspired Purses. 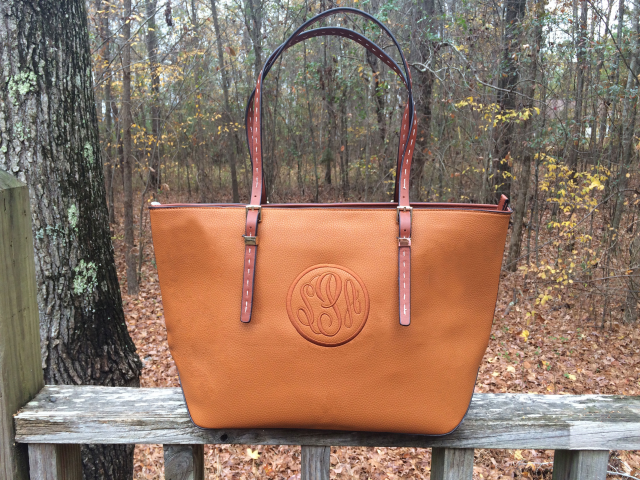 Breathe new life into your wardrobe with this monogrammed purse from I Flew the Nest. 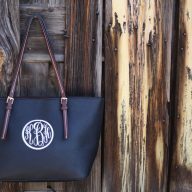 Custom made in designer detail, it features handsome leather handles and a coordinating monogram of your choosing. It is spacious enough to hold your iPad, wallet and everything else you need to get through the day. This monogrammed purse looks great with business or casual wear. It also makes a wonderful birthday gift for a best friend. Custom gift-wrapping is available by request. This is a limited edition I Flew the Nest original design. 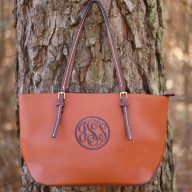 Our monogrammed tote in mocha will make an outstanding gift for your bridesmaids, holidays, anniversary, mother’s day or any other time your need to give a monogrammed gift to somebody special. Bid day, big little reveal, you name it, I Flew the Nest has got you covered! 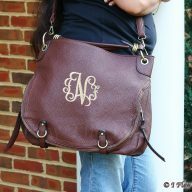 Pictured is our mocha purse with a color on color monogram. 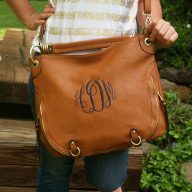 To get a similar looking purse, choose the bronze thread color and Master Circle font. If you would like a circle around your initials, indicate this in the “comments” section of your order. When you order a monogrammed purse from I Flew the Nest, we always work hard to ensure you have a great shopping experience. Typically we ship within one week. If you have any questions, always feel free to reach out to us via telephone or email. We are always here to answer any questions you have. Of the clutches also sold in this site.